Meizu is making its presence felt in the mobile market with their new elegantly designed phones. It is picking up its pace and this time has come with Meizu X phone which is being brought in the market with a new design in a decent price range of 16,990 INR. The best part about Meizu X phone is that it comes with a new design which is a breath of fresh air when compared to their other phones. You cannot deny that this model has taken its inspiration from the mobile giant Apple. The Meizu X camera position has been shifted under the lower bezel which has notched the overall design to a higher mark. 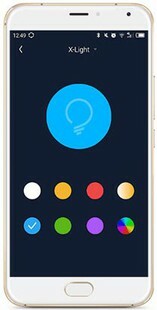 Meizu X has four colors - black, blue, gold and white. The Meizu X gold is quite shiny and grand. As a phone, a subtler colour might have been preferred, but it again depends upon your personal choice. Also the Meizu X display is not very impressive. The Meizu X display is said to be an IPS LCD unit with a size of 5.5 inches. Considering the Meizu X price in India a better display was expected in this range. It has a full HD display with a resolution of 1080x1920 pixels with a 401 ppi density. The screen to body density is said to be at 71.8%. The Meizu X dimensions have still not been released but it said to be weighing at 165 gms which is a tad bit higher than the other phones. As mentioned previously, the Meizu X phone design is new when compared to the other Meizu phones. They have shifted the camera to the side instead of keeping it in the middle as they normally did with the other phones. The speaker along with the headphone jack is shifted under the lower bezel, kind of replicating the Apple phones. The primary camera is 12mp and the secondary camera is 5mp. The Meizu X camera quality seems to be decent enough, though not remarkable. A better front camera would have been expected in this price range as most of the phones of this range are normally equipped with an 8mp front camera. The other Meizu X camera features include AF Phase Detection, Auto Flash, CMOS image sensor, Continuous Shooting, Exposure compensation, Face detection, Geo tagging, High Dynamic Range mode (HDR), ISO control, Self-timer, Touch to focus and White balance presets. The Meizu X battery is said to be of 3200mAh which would last you almost a day. It also features quick charging which is quite beneficial these days. The Meizu X battery life can be known only when it is released and tested. The Meizu X specifications include a 3GB RAM, 32GB of internal storage and a processor of Octa core (2.3 GHz, Quad core, Cortex A53 + 1.6 GHz, Quad core, Cortex A53). Once released, its smoothness can be judged. The Meizu X phone is decent enough with a set of good features. The Meizu X price seems a bit higher when compared to its features but otherwise it seems to be a good buy. Meizu X full specs and reviews as of Apr 2019. Buy it here!